The short stocky Beagle, originally bred to track rabbits, is active indoors but does not require a lot of space making it a good pet even in an apartment. Beagles are gentle, sociable and happy dogs. They are good with people and other dogs, and they get along well with children. Beagles are quite intelligent and brave. When selecting a Beagle, look for eye and back problems. Bloodlines should also be checked for history of heart disease and epilepsy. Breed Type The Beagle is a hound breed. It is good at tracking rabbits and other small game. Background Beagle-like dogs have existed fof more than 2,000 years, but the modern Beagle was developed in the 1830s. 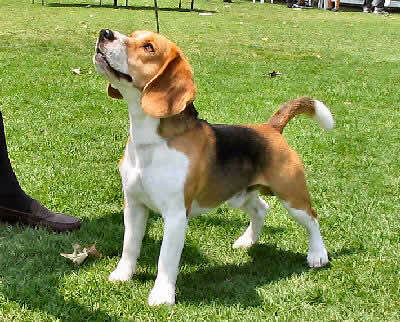 English in origin, the Beagle is thought to be a product of crossbreeding of the Talbot Hound, North Country Beagle, Southern Hound, and Harrier. A popular strain of Beagle is the Patch Hound, which is known for its skill at rabbit hunting. Popular hybrids include the Puggle, a cross between a Pug and a Beagle. Description The Beagle has a short coat, and can be tri-color, black and tan, or red, orange, or lemon with white. The dog's muzzle is straight and boxy, and it has long, wide ears. Females are usually 13-15 inches tall and weigh 20-23 pounds, and males are 14-16 inches tall and weigh 22-25 pounds. The AKC and CKC separate Beagles into two varieties: Under 13 inches and 13-15 inches. Care and Feeding The Beagle needs a diet high in carbohydrates, with a high fat to protein ratio. Foods that contain potatoes, mutton, rabbit, poultry, wheat and corn satisfy these requirements. Food intake should be carefully controlled to avoid obesity. Beagles need regular brushing, and should be given baths only as needed. It is important to keep their nails trimmed and keep an eye on their ears, as their design makes them prone to infection. Beagles are average shedders, so regular vacuuming is a must. They also have a typical hound scent, so it will be necessary to shampoo the carpet and clean the furniture regularly. Housing Your Dog Beagles can live outdoors or inside. Although they are active indoors, they do not require a lot of space. They can do well in apartments, but they need somewhere to exercise outdoors. Social Behaviors Beagles are very friendly dogs, and they get along well with adults, children and other dogs. They can do well with other pets, but it is preferable to introduce non-canine pets to them while they are young. The Beagle is happiest when he has company, so if you won't be home much consider a pair. Handling and Training Beagles are often difficult to housebreak, and they can be stubborn and easily distracted during training. But with patience and consistency, they can learn a great deal. Activities Beagles are energetic dogs, and they need plenty of exercise to stay fit. They will need to be on a leash for their daily walk, because they tend to take off after the scent of small animals. Beagles enjoy playing in the yard, but it is important to keep it fenced in. Breeding/Reproduction When considering a mate for your Beagle, check the potential sire or dam's bloodlines for a history of heart disease, epilepsy, and eye problems. Litters consist of an average of seven puppies. Common Health Problems Beagles sometimes have epilepsy, but it is usually controllable with medication. Other problems include hypothyroidism and developmental disorders. Eye problems are also common in the breed. There are a couple of conditions that can show up in this breed. 'Funny Puppy' is a condition unique to beagles that results in slow development, weak legs, and a crooked back. 'Chinese Beagle Syndrome' is another condition in which the dog has slanted eyes and under-developed outer toes. Availability The Beagle's popularity makes it fairly easy to find them. Breeders are abundant. Prices average from $400 to $600, and may be higher depending on lineage. I have discovered that beagles find upright pianos very tasty. Our beagle, Daisy, liked to nibble on the keys while we ate dinner. Thus, we had music while eating, and Daisy loved the noise she could make. Daisy no longer plays piano, as she is now almost eleven years old. I'm pretty sure she's off pretending to be famished as my sister finishes her breakfast. I had a male beagle from a pet store for 13 years until he died of cancer. I also saved a 5 month old beagle mix from a bad home a year later. She lived for 12 years (even though she had many problems such as hypothyroidism and then later in life she developed diabetes and blindness). They were wonderful dogs and were very close to each other. They were very good with my boys. The problems that I had were the peeing especially when I would go out. I had to crate them everytime I would go out. They also dig up your yard horribly! A fence is a necessity, though you must chip them because they will dig under the fence and get out. Beagles are very cute, affectionate, and funny. They can be mischievous, and they act like they are starving all of the time. They cannot get enough food, and will even dig in garbage to get some! I recently adopted a beagle/shepard mix from the shelter. She is almost a year old and she is incredible with my 15 year old Autistic son and especially with my almost 2 year old Down Syndrome son. At times, he has gone up and smacked her, and she just rolls on her back and lets him, then licks his face to say it's ok and she understands. People considering this breed should be patient people who love animals. Beagles can be trained, but they kindly resist for a while. Beagles want to be a big part of a family, so you should be home a lot and include them in outings. A chest leash is important because a neck leash will choke them as they pull with their nose to the ground. Remember to check and clean their ears often, and when their ears get wet, dry them inside and out thoroughly. Overall, a beagle is a great choice with the right owner and family. They drop a lot of hair ? I refused to allow my husband get a beagle for 22 years despite numerous requests. Then in a weak moment I agreed to it. He grew up with beagles. In short order I learned to love their quirky personalities. I had a golden retriever and took him through many obedience levels. When I attached a lead to our first beagle, he laid down and looked pathetic. I taught him 6 tricks in 4 days and no issues with getting him potty trained. So he was trainable. He leads nicely now I just had to remain patient and persistent. We now have 4 indoor beagles that enjoy our fenced in backyard. I wrote a book about their funny antics. They are immature so keep working with them. Look for it soon. Marlow and a Gaggle of Beagles for Me. They make us laugh every single day. Appears first in the Rabbit Hunter magazine 9/2015. Good luck with your beagle.